Parents who attended the NIU College of Education’s Spring 2018 Community Learning Series left with a loud-and-clear message. They must advocate strongly and continuously for their children with autism, especially when those children are in high school or nearing the age of 22 as they move into adulthood. Future teachers of special education heard the same call to action during the Tuesday, April 10 event. Daunting as it might seem, however, the process is not impossible. Johnston-Rodriguez, a professor in the NIU Department of Special and Early Education, began with statistics on young adults on the autism spectrum. Nineteen percent of young adults with Autism Spectrum Disorder (ASD) between the ages of 20 and 25 have lived independently from their parents without supervision after graduation. Only 58 percent had ever worked during their early 20s. Meanwhile, while 97 percent received transition service during high school, many are left without such supports and services afterward. Thirty-seven percent “disconnected,” neither continuing their education nor working outside the home; 28 percent were unemployed, not attending postsecondary school or training and without support or services. Benji Rubin, an attorney with Rubin Law Offices whose practice is exclusively limited to special needs legal and future planning, told parents that they need to begin the work toward the age 22 cut-off as soon as possible. Age 21 is too late, he said. High on the must-do list is the PUNS (Prioritization for Urgency of Need for Services), the statewide waiting list. Those without funding or services could find themselves simply “sitting at home” while they wait beyond their 22nd birthdays. Siblings of young adults with ASD also must prepare, Rubin said. 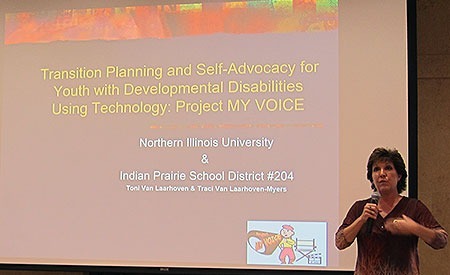 NIU Presidential Teaching Professor Toni Van Laarhoven and her twin sister, Traci Van Laarhoven-Myers, vocational coordinator at Waubonsie Valley High School, spoke of the power of self-determination and self-advocacy. Their “Project My Voice” enables students with intellectual disabilities to participate fully in their transition planning through expressing their preferences in such areas as education, employment, living arrangements, health, safety, community and more. Panelists also told the audience about Indicator 13 – it calls for annual updates of postsecondary goals of young adults ages 16 and older who have Individualized Education Plans (IEP) – and its demand for evidence that the students are invited to their IEP meetings. Kori Jung, teacher and case manager in the Arlington Heights District 214 Transition Program, advised future teachers in the audience to truly know their students as well as their families and to advocate for them. Khushbu Dalvi, program coordinator for the Parents Alliance Employment Project, explained her role in Project Search, an internship-based program in local hospitals. The initiative also helps students with their interview skills as well as leadership development. “Even if you know how to do the job, you still have to get a foot in the door,” Dalvi said. Students who’ve already become integrated into the hospitals can then teach their peers about how to succeed at the internships. Questions from the audience touched on such issues as customized jobs, how to find employers, equal wages, the most important government benefits, physical education and more.